It used to be that when I wanted to eat away at the lawn a little more and make a new bed for planting in, we’d rent a sod cutter and remove slices of grass (and/or weeds) with their roots, and then dig in compost until the soil was right for planting in. Now I’m using the no-dig sheet composting method, which is easier on the back and works just as well. Here’s how I created a new shade to sun bed for small trees, shrubs and perennials last September. I decided on the shape of the new bed, which covered an area on the property line between us and our neighbors and extended a previously-established (and jointly-planted) shade bed but continued into a partly-sunny area. The “lawn” I was reclaiming was pretty much weeds. 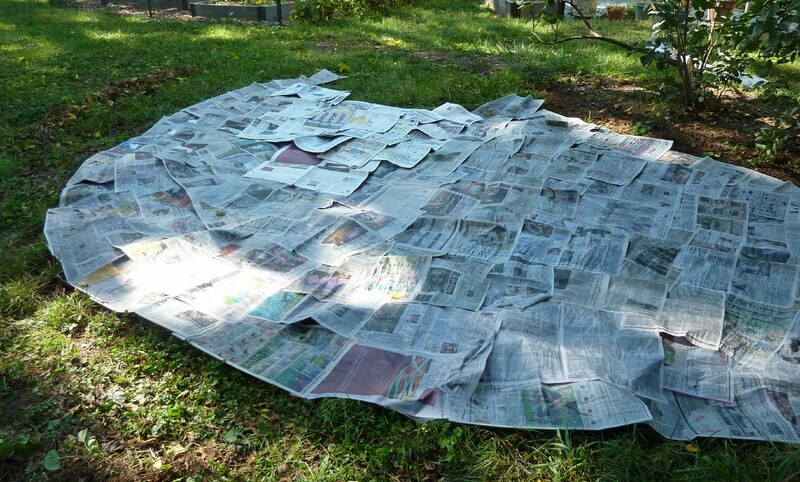 I mowed it short and then started laying down newspaper; you need about 8 pages of newspaper but I don’t bother counting, just put down sections and overlap them. Save your papers for a while if you’re planning to do this. You can revisit the news while you work (I have papers on the bottom of my pile from the 2008 election – that will be interesting!). Cardboard also works but takes longer to decay. I kept a hose handy and sprayed the newspaper with water as I worked so it didn’t blow away. Finally the entire shape of the bed was laid out. Time to plant! I could put my larger plants in right away because the soil underneath was good. If you have solid clay you probably want to wait until you’ve created some new soil above the paper. 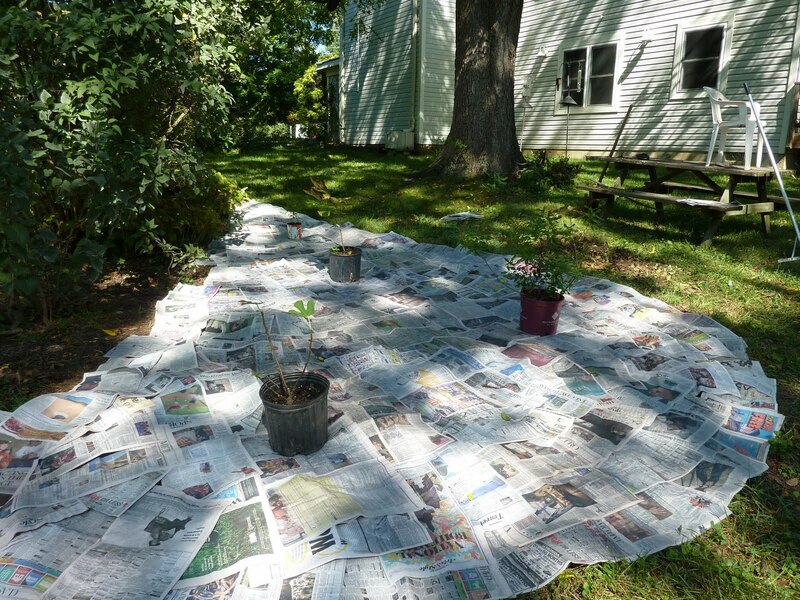 I arranged the pots in the bed, imagining the full size of the grown trees and shrubs, and then made cuts in the newspaper and dug holes to plant them – not too deep, because soil would be covering the paper. This counts as a Grow It Eat It bed because I put in a fig tree and a pawpaw. If I want fruit on my pawpaw I’ll need to put in another one… somewhere. Not sure where yet. The other plant you see is a bayberry. Next I started the layering process. 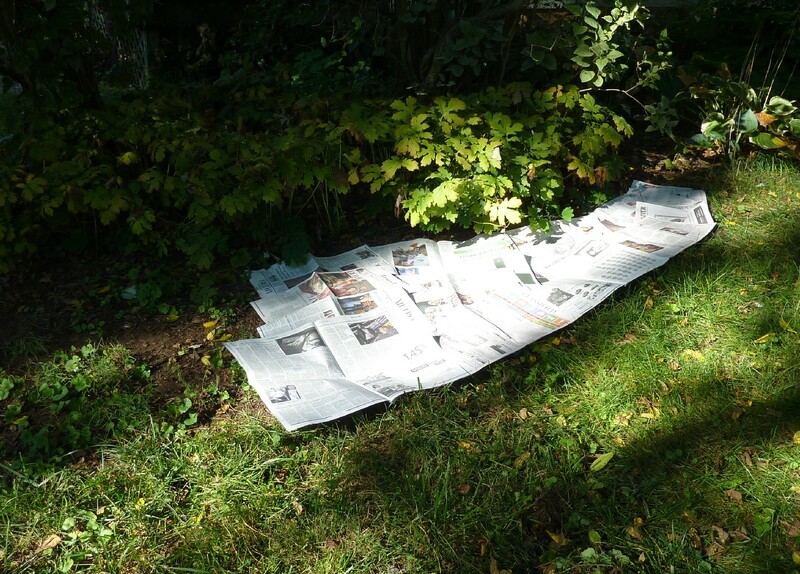 On top of the newspaper I spread some compost and, as the autumn progressed, fallen leaves and grass clippings. Lots of materials could go to make a sheet composting bed (see page 3 of HGIC’s Backyard Composting fact sheet for more information); if you are planting in it right away as I did, you need to use already finished compost and keep fresh materials like grass clippings away from the new plants. My poor little Celeste fig tree looked dreadful in September. It had sat in the Whole Foods parking lot for several weeks while I dithered over buying it, and when I brought it home it dropped all its leaves but one. But I planted it anyway, gave it a little fence but no other protection over the winter, and it came through just fine (I took this photo last week). 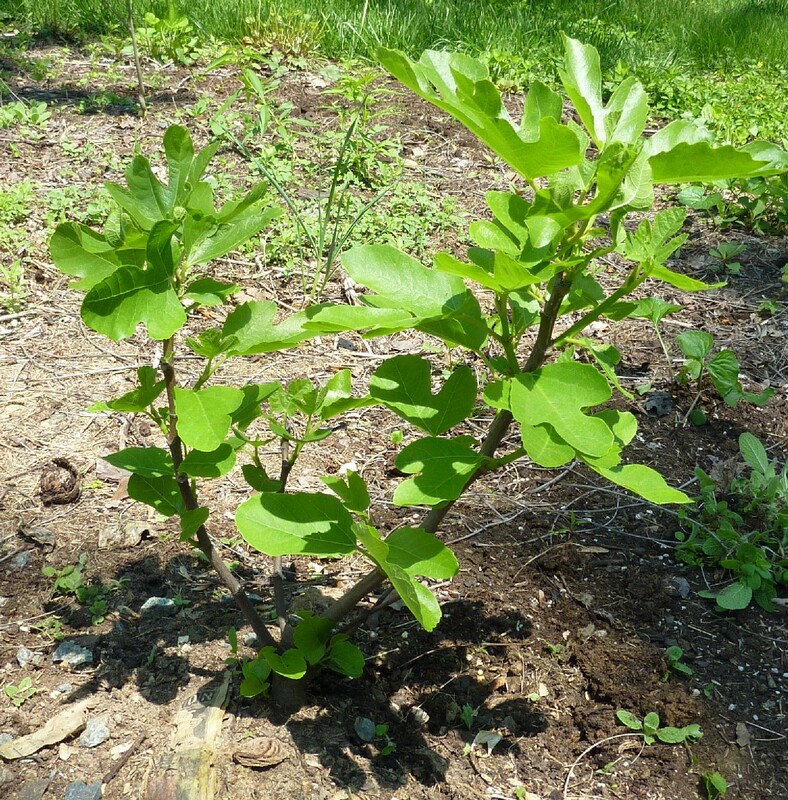 I’m hoping it grows up and produces lots of figs. Later last fall I put in a few perennials and some small bulbs, and I’ve continued to plant this spring, but it’ll take a while to fill up the bed. Meanwhile I’m mulching and I’ll add more compost in the fall along with some leaves. Last fall’s materials have decayed into a loose rich soil. I have had to pull out a lot of weeds… and I have a large patch of columbines coming up in the middle that I didn’t plant. 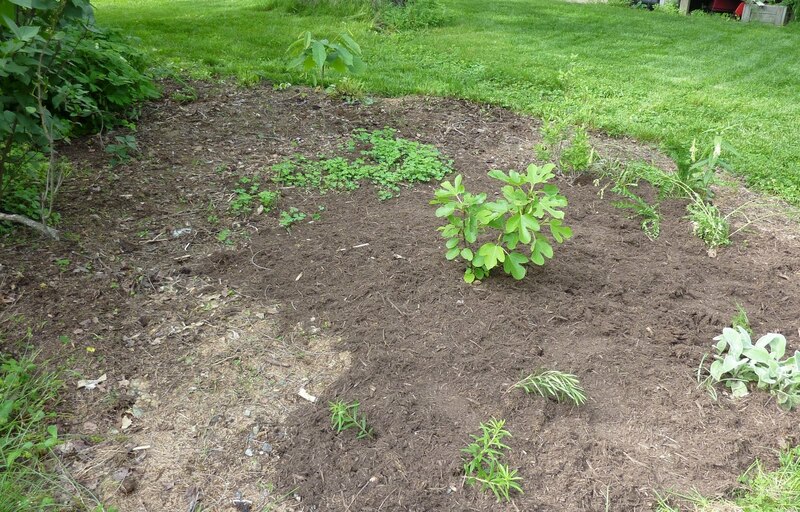 Here’s the bed, still very sparsely planted, with mulching ongoing. I’ll see what I come up with to fill in some space. Perhaps some herbs in the sunniest area; not much else in the Grow It Eat It realm since deer, rabbits and groundhogs come through pretty often. Hot peppers, perhaps. The best thing about this method is how quickly you can move from imagining your new bed to having it, without back-breaking shovel work. I’m doing part of my vegetable garden this way too, but haven’t had time to accumulate materials to build it up yet. Next year!